With the 1960's emergence of grocery chains in South Africa, a group of eight wholesalers were given the exclusive rights to the SPAR name in 1963, to service 500 small retailers. A number of mergers and take-overs followed, and today, The SPAR Group Ltd operates seven distribution centres and supplies goods and services to SPAR stores in South Africa, Swaziland, Botswana, Mozambique, Namibia, Zimbabwe, and Zambia. SPAR is more than just a retail chain. SPAR operates under "voluntary trading" principles which means that retailers are encouraged to be independent and to develop their own identity. While retailers can take advantage of SPAR's trading power, they can also source goods from local suppliers. Every one of the stores has been made with one thing in mind, to create the most unique shopping experience for their most valuable asset, their customers! That is why each store has an individual personality. The group continues to aggressively focus on driving the retail growth of existing stores, looking for new business opportunities, stringent cost control and securing operating efficiencies. During 2011, 25 new stores were opened. Of particular satisfaction was the upgrade programme which resulted in 126 stores completing revamps. It is anticipated that 25 new stores will open during 2012, which, together with store revamps, will add approximately 3% to retail trading space. SPAR branded products had a solid year achieving wholesale sales in excess of R3.9 billion and a growth of 9%. Extensive product development took place with 310 products being introduced or repackaged. In many instances packaging now includes detailed information on product ingredients and guidelines on recommended daily consumption, the objective being to help consumers to live a balanced and healthy lifestyle. KWIKSPARs with selling areas of up to 600 m2 are designed for every day convenience. These stores focus on speed, and freshness in terms of produce, bakery, meat and prepared and takeout foods. KWIKSPARs carry a range of groceries at prices that offer good value for all shopping preferences. With selling areas of 700 m2 and above, SPAR stores focus on neighbourhood and rural supermarket shopping. SPAR stores are very competitively priced with a strong focus on friendly and professional service, and offer a comprehensive range of groceries backed by fresh produce, in-store bakery, butchery, deli and home meal replacement departments. SUPERSPAR stores have selling areas greater than 1300 m2. The stores are aggressively priced against the chains and offer a full range of groceries and general merchandise, backed by extensive service departments such as produce, bakery, butchery, deli and meal solutions. Through TOPS at SPAR stand alone liquor stores, SPAR encourages their retailers to expand their offering to include a full range of liquor products. Membership is an extension of The SPAR Guild and is only available to existing SPAR group retailers. TOPS stores must be located within close proximity of the member's store. The group now services outlets throughout South Africa, Namibia and Botswana. TOPS can now boast to being the biggest liquor chain nationally, being number one in store numbers, turnover and media spend. The group anticipates a solid trading performance in the year ahead and expects to open 32 stores, this not-withstanding that the issuing of liquor licences remains erratic in some regions. SPAR, owns the Build it trade mark, with Build it stores operating as stand-alone building materials outlets selling basic building and hardware products to home builders and renovators in the lower to middle sectors of the market. Membership is controlled through the Build it Guild, which is independent of The SPAR Guild. Membership is not confined to SPAR members. 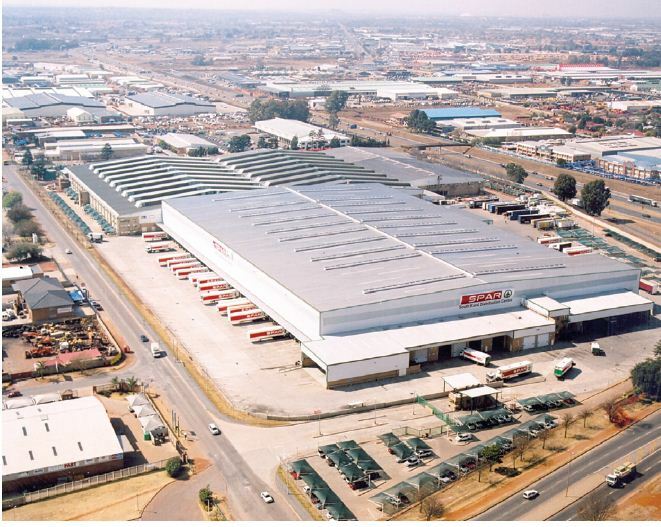 The 10 000 m2 SPAR Group Imports Warehouse opened in the third quarter of 2010, as planned. This facility handles an extensive range of imported hardware for distribution to Build it retailers around the country. A further 21 new Build it stores are forecast to open in 2012. Savemor is a new retail format aimed at making inroads into small rural towns and central business districts where the cost of setting up a SPAR store can't be justified. 11 Savemor stores were opened in 2011 and a further 12 stores are scheduled to open in 2012. Five Pharmacy @ SPAR stores opened in 2011. Spar anticipates opening an additional 10 stores in 2012. SPAR strives to be an employer of choice. The group continues to examine its staff value proposition to ensure it remains appropriate to attract and retain bright, young and talented individuals. Training and development of retailer staff remains a key focus area in order to sustain growth into the future. The group is committed to offering competitive remuneration packages and to creating an environment which encourages staff to "live the brand". SPAR's corporate social investment (CSI) programme is aimed at bringing about positive social and economic changes to the previously disadvantaged communities in which the group conducts its business. The programme broadly focuses on four areas, namely: poverty alleviation; healthcare; hunger; and safety. SPAR spent R9.6 million on community development projects in 2011. SPAR is committed to measuring an impact on the environment and have once again participated in the Carbon Disclosure Project assessment. In 2011 we obtained a 85% disclosure score (73% in 2010) and a C band performance score. Specific projects covering warehouse design, targeting reduced energy usage, recycling and waste disposal, biodiesel trials and vehicle selection are all receiving attention. During October 2011 SPAR held the second children's conference on the Environment in Durban. which was approved by the shareholders.